the 19,286 names of airmen who died during the Second World War. Review the progress of the Above and Beyond Capital Campaign. The Museum is proud of the way we have handled your generous support. As a donor we are sure you will want to see the results. put in place because of the Capital Campaign. 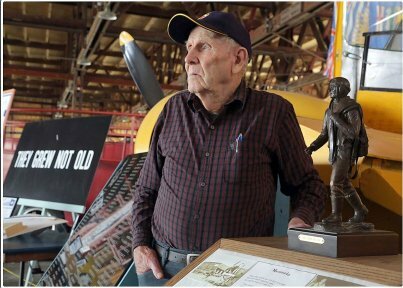 Preview the ‘They Grew Not Old’ Memorial Monument. 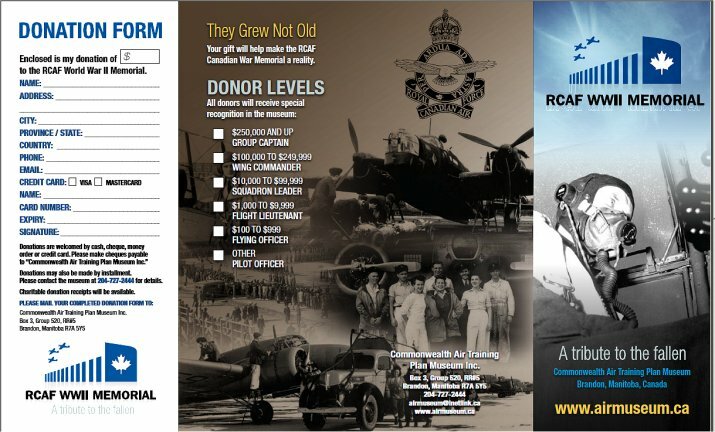 As mentioned in the Capital Campaign it has long been a desire of the museum to honour all the RCAF fallen. the Museum is excited to be able to etch their names in granite. The Monument is well underway and you will be able to preview the progress. the Memorial Book which is housed in the Chapel. ....the unveiling is September 10, 2014. We are 1/3 of the way up the thermometer and climbing! 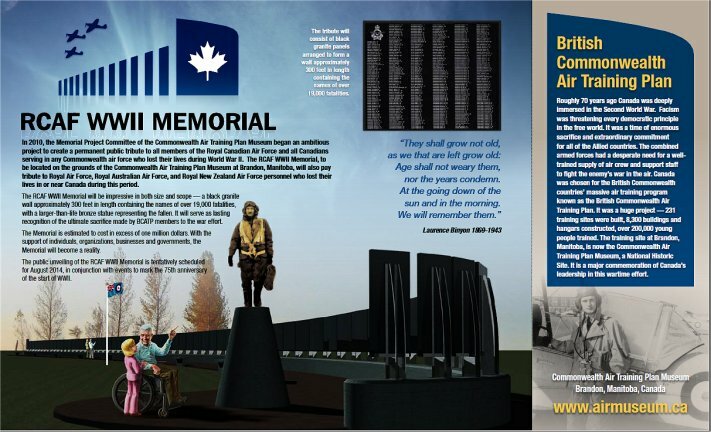 The media has been running many promos announcing the BCATP RCAF Memorial Project. The pages above were featured in the agricultural magazine: Simmental Focus. THE ONLY MEMORIAL OF ITS KIND IN CANADA. 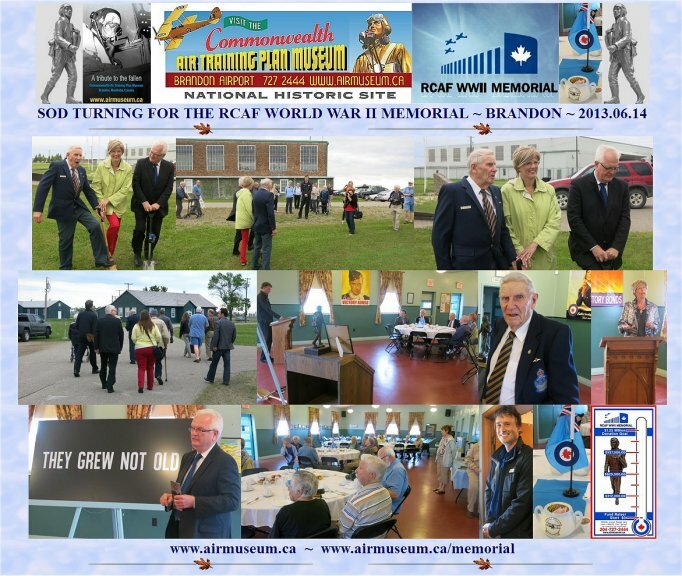 WHAT: Sod turning of the Memorial Project Committee of the Commonwealth Air Training Plan Museum to create a permanent public tribute to all members of the Royal Canadian Air Force and all Canadians serving in any Commonwealth air force who lost their lives during World War II. 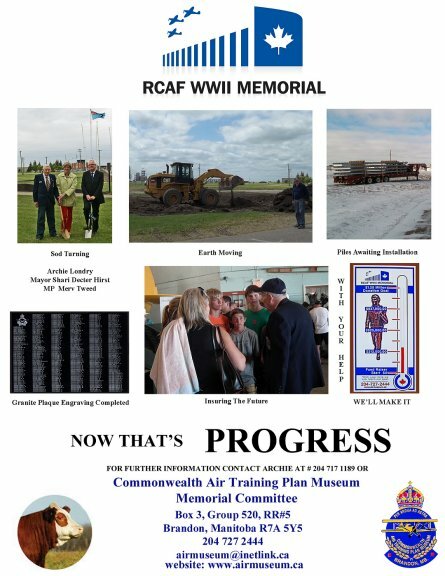 DETAILS: In 2010, the Memorial Project Committee of the Commonwealth Air Training Plan Museum began an ambitious project to create a permanent public tribute to all members of the Royal Canadian Air Force and all Canadians serving in any Commonwealth air force who lost their lives during World War II. 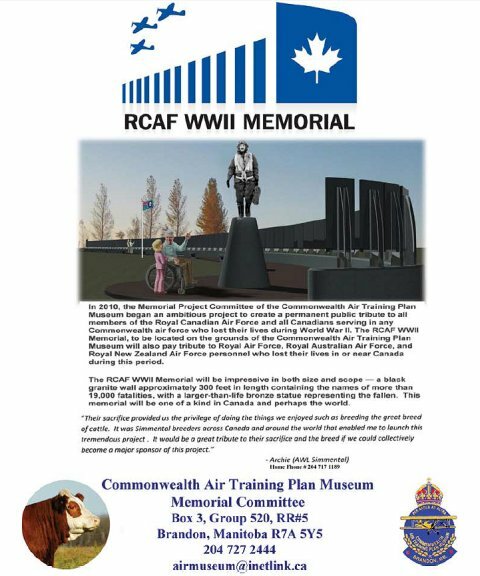 The RCAF WWII Memorial, to be located on the grounds of the Commonwealth Air Training Plan Museum at Brandon, Manitoba, will also pay tribute to Royal Air Force, Royal Australian Air Force, and Royal New Zealand Air Force personnel who lost their lives in or near Canada during this period. 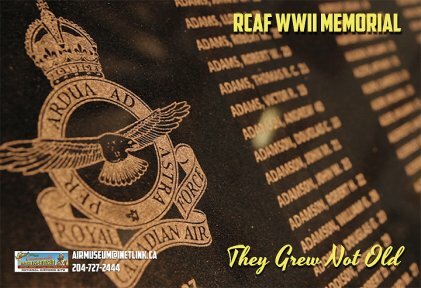 The RCAF WWII Memorial will be impressive in both size and scope — a black granite wall approximately 300 feet in length containing the names of over 19,000 fatalities, with a larger-than-life bronze statue representing the fallen. It will serve as lasting recognition of the ultimate sacrifice for the war effort. 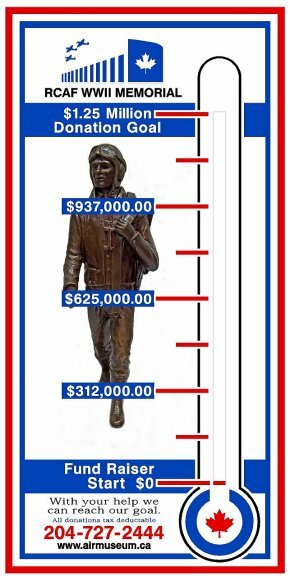 The Memorial is estimated to cost in excess of one million dollars. With the support of individuals, organizations, businesses and governments, the Memorial will become a reality. 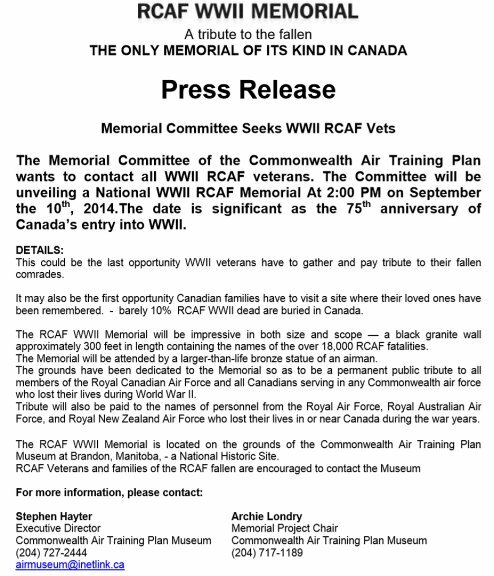 The public unveiling of the RCAF WWII Memorial is tentatively scheduled for August 2014, in conjunction with events to mark the 75th anniversary of the start of WWII. 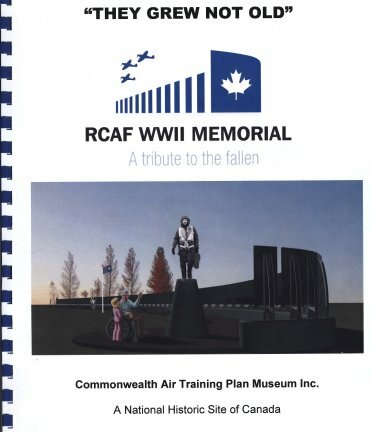 The Commonwealth Air Training Plan Museum is Canada’s only museum dedicated solely to preserving the history of those who trained and fought for the British Commonwealth during WWII. The Commonwealth Air Training Plan Museum is proud to be one of the six Manitoba Signature Museums, a Manitoba Star Attraction and a National Historic Site. Missing from the photo are Michael Cox and Harry Hayward. The pace has picked up for the Memorial Committee has picked as Reg Atikinson has joined the team as Fundraising Chair. Leech Printing has assisted in producing a brochure, logo and letterhead. The commission of the statute has been awarded to Don and Shirley Begg of Studio West. The committee was most impressed with their references and their attention to detail. They visited the site and spent many hours with Archie Londry and John McNarry concerning to attitude of the figure. They will be producing a 12 inch maquette for our approval. More information about Studio West Ltd. Can be found on our website. The Committee is currently working on the consecration of the ground for the Memorial which requires engineering, surveying and architectural input. Rapid City Memorial, who was awarded the contract for the engraving of the granite, are working with Harry Hayward to proof the names. 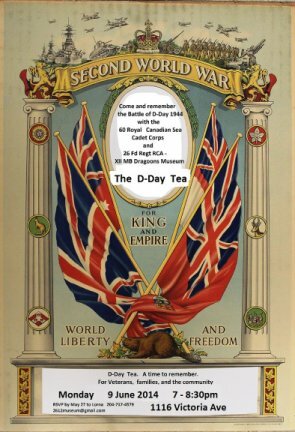 commemorating the centennial of the beginning of the First World War. 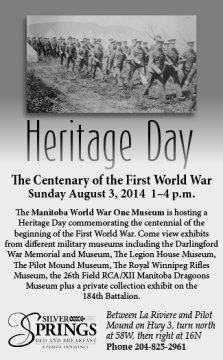 plus a private collection exhibit on the 184th Battalion. on Highway 3 Turn north at Mile 58W and right at Mile 16 North. Program Manager / Gestionnaire du programme It's An Honour! / C'est un honneur! 34th Annual Vimy Night a success. The Friends of the 26th Field Regiment Royal Canadian Artillery/XII Manitoba Dragoons Museum invite everyone to attend our Thirty-Fourth Annual 26th Field Regiment RCA/XII Manitoba Dragoons Museum Vimy Night Celebration and Fundraiser on Saturday 5th of April 2014 in the Brandon Armoury. Doors open at 6:00 pm, supper will be served at 6:30 pm. Vimy Night will consist of a Chinese Food Buffet, entertainment provided by the 26th Field Regiment Pipes and Drums, and a live auction plus a silent auction. The Chinese Food Buffet tickets are $15.00 per person. Admission to the auction is free which will follow the buffet. Entrance to the armoury at 1116 Victoria Ave. is via the 11th Street door. There will also be a cash bar for alcoholic and non-alcoholic beverages. 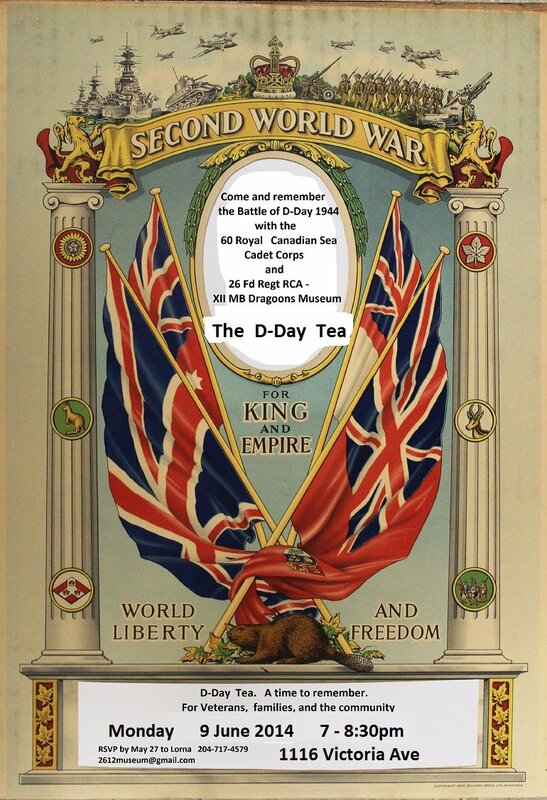 D-Day saw a big change in Europe and also in Brandon. Brandon had losses all during the war but now things went into high gear. We lost three Brandon boys that day. Rifleman KENNEDY, ALLAN JOSEPH H/103100. A Manitoba service number, but we do not know how he ended up in the Regina Rifle Regiment. Many Brandon boys served in units from all over Canada. Brandon's former alderman of the '50s and '60s -- J.M. Shurb was a Sgt. with the Regina Rifle Regiment having been transferred from the Royal Winnipeg Rifles to teach rifle shooting. There are many reasons for serving with more distant units. Rifleman WORONCHUK, EUGENE J. B/142310 (the B is probably a typo and it should be an H) Royal Winnipeg Rifles. This stocky fellow was also a wrestler who was popular in Brandon at that time. He showed up one evening at his girls' home to say good-bye as they were shipping the RWR out the next day. He said that he would not return. The girls there all said for him not to take that attitude but he had already lost his neighbor on Eighth Street North to an ammunition accident in training and had a bad feeling. That neighbour, Rifleman PURPER, WILLIAM H/41015 Royal Winnipeg Rifles, had died at Shilo on 11 May 1940. In June of 1944 the girls, including his pal, were spending a warm evening singing. Another girl ran over saying, "The family just got news and Woronchuk has been killed." The girls never sang again during the war. Corporal KLOS, WALTER JOHN H/41048 Royal Winnipeg Rifles. Raised on Twelfth Street North, Klos had ended up as a mucker in the mines of Flin Flon. This is copied from the book Juno by Ted Barris and tells of Cpl. Klos's last moments on Juno beach. The Winnipeg's 'B' Company, and the Royal Canadian Engineers 6th Field Company assault team working with them, had one of the highest beach casualties of the day. The company had lost almost three-quarters of its men. Their courageous company commander, Captain Gower, was left with only twenty-six men. A pill-box on the west side of the Seulles River contained a 75 mm field gun and a very large anti-tank gun. A story of unimaginable courage took place near this pillbox. It concerned Corporal W.J. 'Bull' Klos. "Rushing the enemy, 'B' Company encountered heavy enemy fire. Corporal Klos, badly shot in the stomach and legs while leaving the assault boat, made his way forward to an enemy position. Men fell all around him as Corporal Klos thrashed through the deep water. Klos was a big, powerful man. Thus the nickname “Bull”. The corporal's rage was greater than his pain. He staggered to the beach and shot an enemy gunner. Despite being wounded, he engaged in hand-to-hand combat with three German soldiers he came across in a pill box. He knifed two of them and was strangling the third with his bare bands when he was killed. His hands still gripped about the throat of his victim produced a chilling sight!" A lady that lost her brother, a Flying Officer told me what it was like on Tenth Street North where the family lived at that time. In the summertime with windows open the sound of the telegraph boy's bicycle bell could be heard. The shout went out and was spread street to street in all directions. The mothers or wives walked to the front gate to wait. Where would the telegraph boy go? For the unlucky ones he turned onto their street and then stopped at their gate. With a telegram coming for every injury, every sickness, every wound, every "missing in action", every "taken prisoner", and every death this began a time of much increased dread for the families on the home front. 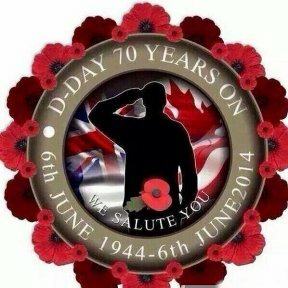 And so it was from D-Day until after the war and the boys came home. to raise funds for the Veterans' Memorial. The Memorial will built on the corner of 11th Street and Victoria Avenue. a Veteran of the Regular or Reserve Forces of Canada. Donations of $100 or more will be recorded on a plaque. Please give your name, the Veteran's name, Rank, Service Branch or Unit.